Worcestershire Rapids will look to extend their unbeaten run when they face an upbeat Yorkshire Vikings in the north group fixture of the ongoing Vitality T20 Blast 2018 on Sunday, July 15 at Worcestershire's home ground - the New Road. Both Rapids and Vikings have won four matches each out of the eight they have played against each other in English domestic twenty20 tournaments. The previous meeting between these two teams in the shortest format took place last season during the group stage at Leeds when Yorkshire emerged victorious by 37 runs. After being put into bat, the Yorks amassed 233/6 in their allotted 20 overs before restricting Worcestershire to 196/7. Yorkshire Vikings: Vikings currently find themselves outside of the top four in the standings with two wins and one loss in three games and they will be looking to move up the table when they face Worcestershire on Sunday. They started off pretty well with an emphatic 44-run victory in the first game against the Durham Jets but suffered an eight-wicket thrashing at the hands of Birmingham Bears in their next match. With the bat, Adam Lyth and Gary Ballance are amongst the leading run scorers for Yorkshire in T20 cricket. Jonathan Tattersall struck an unbeaten 53 against Durham and he will look to make another notable contribution here. With the ball, Tim Bresnan is one of the most successful bowlers in the side and he will have a big role to play. Similarly off-spinner Azeem Rafiq has 89 T20 wickets under his belt, while Skipper Steven Patterson has 51 wickets and both have the ability to trouble the batsmen. Expected Playing XI: Steven Patterson (C), Adam Lyth, Tom Kohler-Cadmore, Jack Brooks, Harry Brook, Gary Ballance, Jonathan Tattersall, Jack Leaning, Azeem Rafiq, Tim Bresnan and Matthew Fisher. Worcestershire Rapids: On the flipside, Rapids are the only side in the tournament who are yet to lose a game. They are sitting comfortably at the pole position in the league standings with eight points in the bag. 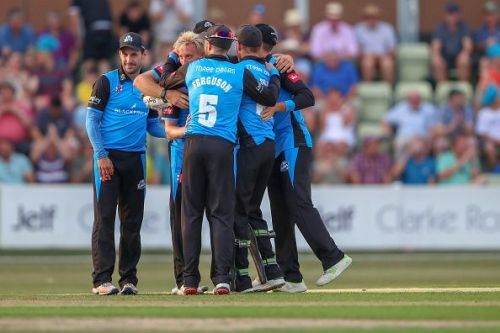 They beat Lancashire Lightning by five wickets in their opening game and then secured a four-run win over the Birmingham Bears, before thrashing Derbyshire by six wickets. They will now be brimming with confidence after their comprehensive 41 run win over Northamptonshire. With the bat, Martin Guptill is looking at his best in this year's T20 Blast and has already smashed two fifties in three games. Daryl Mitchell, who has scored the most runs for Worcestershire in this format, will be the go-to man for the team. With the ball, Patrick Brown and Ed Barnard have taken five wickets each in three matches and both seem to be the main threats in this pace attack. Expected Playing XI: Brett Oliveira (C), Martin Guptill, Joe Clarke, Dillon Pennington, Callum Ferguson, Ben Cox, Daryl Mitchell, Ross Whiteley, Patrick Brown, Luke Wood and Ed Barnard.